An illustration of the Moonhouse stands on the moon with Earth looming in the background. Image released May 28, 2014. This artist illustration shows what the Moonhouse could look like when it self-assembles on the lunar surface. Image released on May 28, 2014. 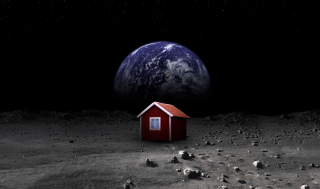 Called the Moonhouse project, artist Mikael Genberg and others involved with the Swedish effort want to place a robotic, self-assembling, red house that is modeled after the kinds of homes seen through much of Sweden on the lunar surface. The team plans to send the project up to space in late 2015 atop SpaceX's Falcon 9 rocket with the group Astrobotic — a private spaceflight team competing for the $20 million Google Lunar X Prize grand prize. "It's a high-tech art project with the goal to inspire people on this planet. I would say it's about breaking mental boundaries," Genberg said during a news conference held in Sweden today (May 28). "We're going build a house there for real, but it's all about breaking boundaries of what we think is possible to do together because this project is all about doing something together that should really be impossible. But together, we can go together and make things. When we actually do this, I think that we will have done something that nobody ever could expect us to do." The Moonhouse is designed to fly to the moon folded up in a shoebox-sized package. After it is placed on the moon, the art installation will unfold and self-assemble as an 8-foot-tall (2.5 meters) red house with white corners, a traditional design for many Swedish homes. It is expected to take anywhere from five to 15 minutes for the Moonhouse to assemble. This is what a typical Swedish red manor looks like. It was painted with Falu Rödfärg paint. Representatives with Astrobotic are planning on monitoring the assembly of the Moonhouse from the lunar surface using high-definition video cameras. At the moment, Astrobotic's first destination is an area of the moon called Lacus Mortis. This particular part of the lunar surface harbors a special feature called a "moon pit," which could actually be an entry to a network of underground caves, according to John Thorton, CEO of Astrobotic. It's even possible that humans may live on the moon by using those caves as a shelter that protects from radiation, micrometeorite impacts and extreme temperature fluctuations, Thorton added. "It could be that people could settle inside of these caves for the first time, and what better place to land the Moonhouse than right next to place where people could settle for a long time in the future," Thorton said. Moonhouse artist Mikael Genberg holds a scaled-down version of the Moonhouse up during a news conference in Sweden on May 28, 2014. Moonhouse representatives have set up a series of prizes for people that contribute to the crowdfunding effort online. Contributors that spend $30 will gain access to a 3D drawing of the Moonhouse that can be printed using a 3D printer. People that pledge $50 will actually get their names engraved inside the real Moonhouse that will self-assemble on the lunar surface.